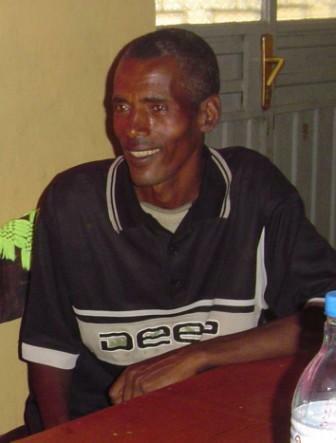 Two evangelists we fell in love with are named Melese. 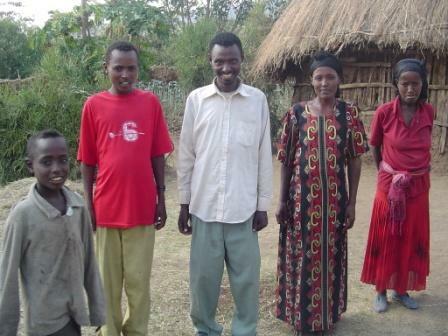 To keep them separate we call one by his nickname “Melli.” Melli is married and has 2 small sons. 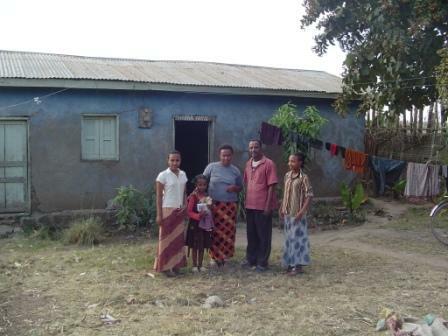 Their home consists of 2 rooms, a cement floor, mud walls, and tin roof. It is situated in a compound with 2 other such homes, a community “shintabet” (toilet hole), and a community kitchen (with wood fire). Melli and his wife sleep on a bed, but the boys sleep on the floor. Their bedroom also serves as living room and dining room. Melli (middle man in the picture) is 38 years old. He is from a large town far from Alaba. He was raised in the Orthodox Church. At about age 20, while very sick in a hospital, he had a vision from Jesus, and he became one of His followers. His family disowned him and for 2 years he lived in the church. This was during the Derg military (communist) rule of Ethiopia. Most churches were closed by the government during this time, but the Durami church remained open. 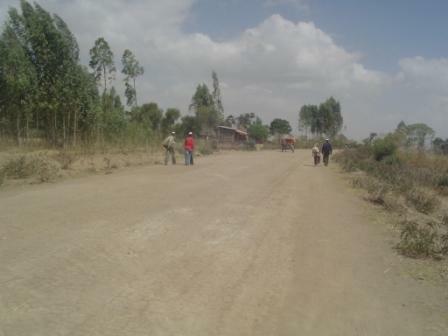 Another time he was walking between villages on the main road; again a group of aggressive Muslim men were pursuing him. They planned to catch up to him and block him in between them, “guiding” him off the road so they could do him harm. He was trying to go faster and faster, but they were catching up. The health of Melli is of concern to me. He is very skinny, and he has stomach trouble; I think he’s already had ulcer surgery. We’re giving him protein bars with vitamins, but will you join us in prayer for his continued protection and physical strength? 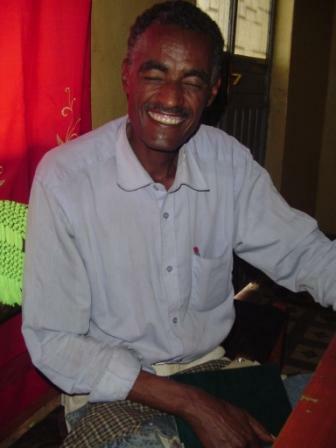 The last evangelist I’d like to introduce is also named Melese. He is married and has 8 children, 6 of whom are still at home. He and his family live in the last house before the river. 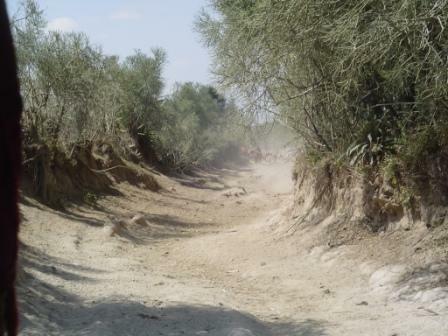 The hyenas pass his home every night as they come into the town to scavenge. 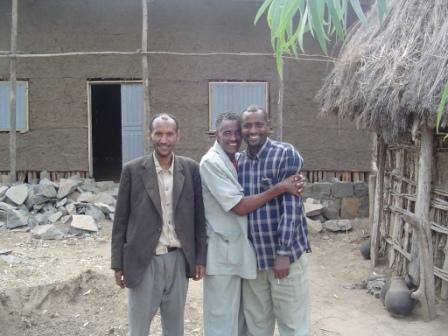 Like Melli’s, his home has 2 rooms, cement floor, mud walls, wooden windows, and a separate hole toilet house and kitchen. There is one other family living in his compound. 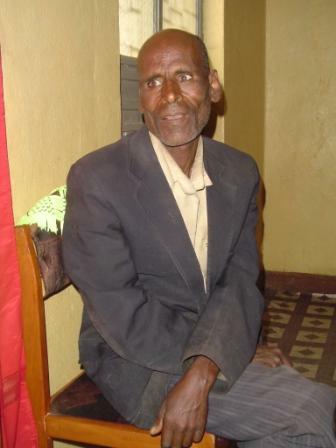 I met Melese’s wife when she came to me with a swollen knee. It had been swollen for about 6 months, and she could barely walk. With God’s help, over the course of 2 weeks, she was much improved through medication I had with me. We got her a toilet seat (so that she doesn’t have to squat) and I gave her strict instructions about using her knee. 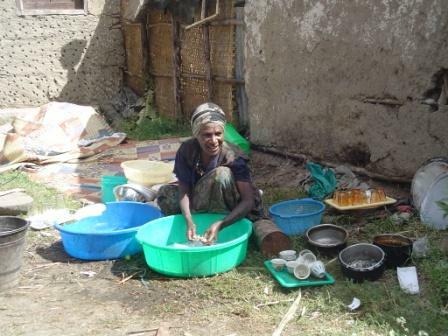 Unfortunately, life for an Ethiopian woman is very hard on the body (see photos below) and, being the wife of an evangelist, there isn’t money for nice things like work tables. 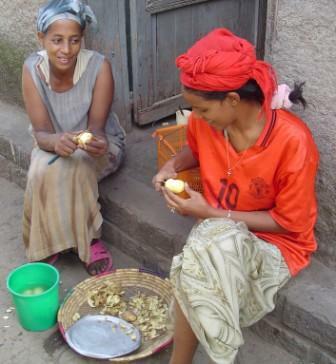 Ethiopian women do their cooking at ground level. 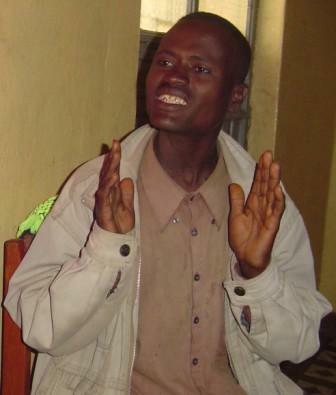 Please pray for Tigist, that she will learn to live with the arthritis God has chosen to give her. 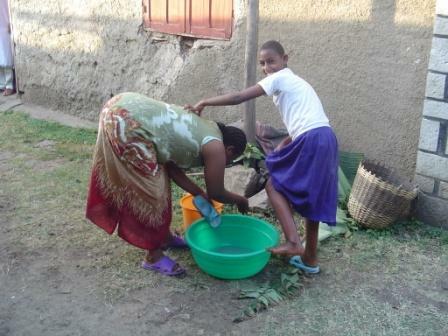 Melese has suffered much because of the Gospel. He doesn’t brag about it; in fact, he tells the stories with hesitation (there is something almost sacred in these stories of God’s personal faithfulness). One such story is the night of the last birth in his family. The births of all his children had been difficult. When the last one was due to be born, their family was living in a row of rooms. To one side was a Muslim family and to the other side was an Orthodox family; they were hated by both. 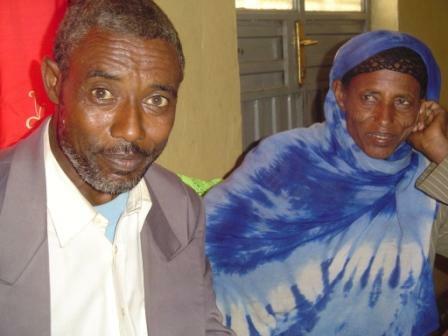 (His wife had already been beaten by neighboring Muslims while he was away.) 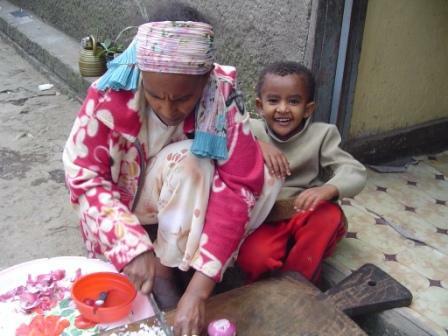 Melese was anxious that his wife’s childbirth could disturb the people next door and inflame antagonism. There was no place to pray in private; so he went to the shintabet (toilet house) to pray. Here, in the “lowest part of the earth,” he pleaded with God to ease his wife’s discomfort and help them. As he lifted himself up from the earth, God spoke to him. “I will provide for you,” He said. I’ve met Salam; she has a peaceful spirit about her that is truly rare. Today she’s about 8 years old, and already she is full of the power of prayer. 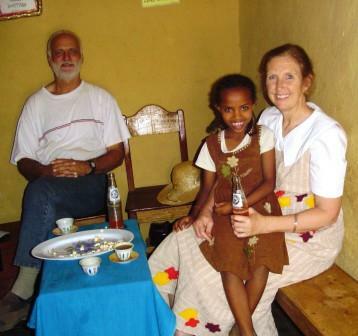 Melese told me that when she was 4 years old she wanted to pray at their family devotions; he kept asking the oldest daughter to pray, but finally he consented and allowed Salam to pray. As she opened her mouth to speak, the whole room was filled with a heavenly light. When we came back from a village I was sporting an arm swollen and discolored from (spider?) bites. The leaders were anxious about it; even I was cautious about it. But on the third day the bites were almost gone; that was the morning that Salam came to our room and immediately checked my arm. She had been praying, and I have no doubt that our Lord was hearing her sweet voice. She was born in faith, and she is living in faith, the faith of our Lord Jesus, the Name called at her birth. 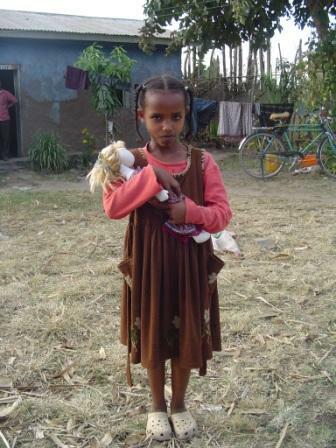 Salam with a dolly given to her by a girl in Virginia. Sharing a snack in Salam's home. The Lord has burdened us with this need. So we are asking the Lord’s servants in America to consider giving to a special Evangelists Fund. These monies will be given to the church to augment the evangelists’ meager salaries. It will focus on those evangelists most in need. Sometimes people here have asked us if they can “sponsor” an evangelist. We are skittish about this personal approach, because the Evil One uses it to divide evangelists between “sponsored ones” and “unsponsored ones”; pride dances with the sponsored group and depression and discouragement haunts the unsponsored group. We have discussed this with the church leaders and we all feel that the best thing is to collect funds designated for evangelist living needs (including clothing, food, medical and children’s school expenses). These funds will be distributed irregularly (as the income is received), and disproportionately (as the various evangelists have needs). So will you pray about this situation and ask our Lord if He wants you to share this burden of relief? If He directs you to help with this need, please be sure to note “For Evangelists” on your check. 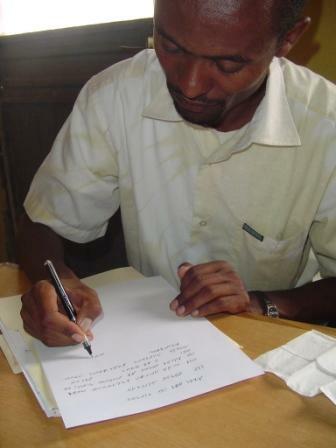 We promise you that every cent will be given directly to the Ethiopian church; we do not deduct “administrative fees.” And every cent will be used by the Ethiopian church for the needs of the evangelists. Your Brothers in Christ. The Alaba Evangelists. Coming up next: Our Goals for 2007.